Painted in the same year as Pissarro's pointillist canvas, this impressionist seascape by Claude Monet is conservative in comparison. 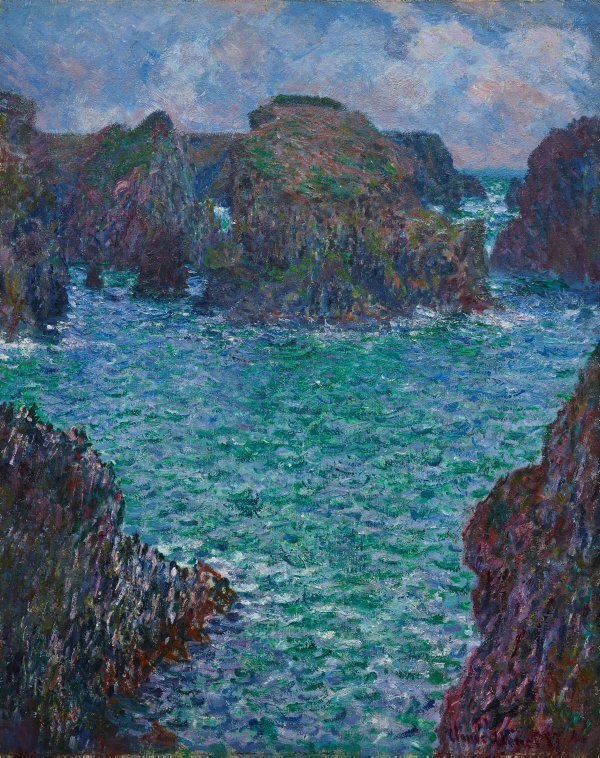 Nevertheless, in the context of Monet's oeuvre at the time it represents an adventurous advance. This is no conventional example of marine painting. The horizon, a feature generally used by seascapists to stabilise their compositions, is completely occluded by the rocks and cliff faces of Belle-Île. These outcrops range with claustrophobic effect across the upper register of the work, appearing as well in the form of cramped promontories on either side of the foreground. The ragged patch of sea thus formed, filled by the painter with countless flecks of paint to indicate waves, is the real subject of the picture. Japanese woodblock prints, commonly available in Paris at the time, provided impressionist and later painters with radical solutions to the problem of representing three-dimensional forms on a flat surface. Few seized these solutions with the alacrity of Monet, or adapted them with such distinction. Signed and dated l.r., red oil "Claude Monet 87". Paul Durand-Ruel, post Jan 1887, Paris/France, letter from Caroline Durand-Ruel Godfroy, 19 July 2000. Ms Durand-Ruel Godfroy writes that it is possible that Durand-Ruel Paris purchased the painting from Monet on 7 January 1887. It is certainly listed in their 1891-1901 Stock Book under the number 1216. In the following stock book it is mentioned as being part of the private collection of Paul Durand-Ruel and is therefore not mentioned as being part of the stock of the gallery. On 26 October 1925 the painting was sent to Durand-Ruel New York and remained in the private collection of the Durand-Ruel family. In December 1935 the painting, now in the collection of Mme Georges Durand-Ruel, was returned to Paris and was later sold by Mme Durand-Ruel on 7 April 1944 to Durand-Ruel Paris who sold it to L Renard on the same day. Mme George Durand-Ruel, Dec 1935-07 Apr 1944, Paris/France, by descent. Durand-Ruel, Paris, 07 Apr 1944, Paris/France, purchased by Durand-Ruel Paris from Mme George Durand-Ruel on 7 April 1944 (stock number 14312) and sold to L Renard on the same day. Rousso Gallery, Paris, pre Sep 1949, Paris/France, purchased by the AGNSW from Rousso Gallery 1949. David Jones Ltd, London acting on behalf of the AGNSW.